Mature. Refined. Perfectly sweet, but not overly sweet. 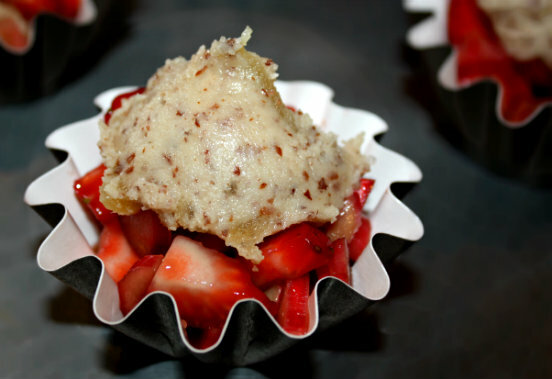 When I first came upon this teeny dreamy dessert at our spring recipe testing, it was love at first bite. 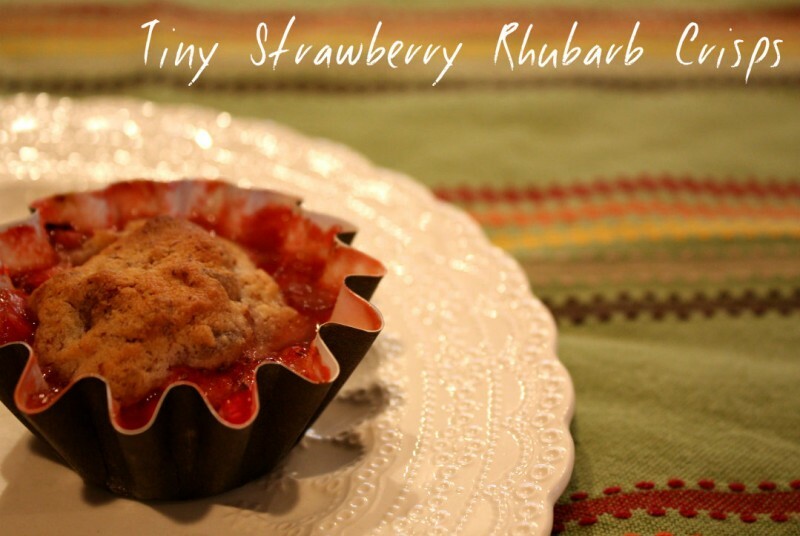 Actually, my slight obsession with the sweet yet tart flavors of strawberry and rhubarb began early in the baking process. 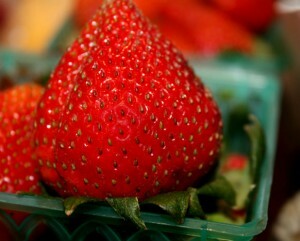 Shiny strawberries teased me with juicy promises, while the bright rhubarb whispered tart nothings. I was sure this crisp recipe would be a great treat for grown-ups. And I was not disappointed. We’ll be making this fantastic recipe with the mamas and families at our fun Mother’s Day Brunch cooking class in San Francisco this weekend. Why not share this recipe with your mama, too?! If you’re lucky enough to live nearby, you can even whip up a batch for her! This recipe can also be found in our dessert recipe library! Prepare Filling: Dice the rhubarb into 1/4 inch pieces. Hull and quarter the strawberries. In a bowl, toss fruit with the sugar and the orange zest. Dissolve the cornstarch in the orange juice, then mix into the fruit. Fill molds: Place baking molds on a parchment lined sheet pan (you can use ramekins, if you prefer). Fill the molds 1/4 full and set aside while preparing topping. Make Topping: In a large bowl, combine all the topping ingredients and pinch them together with your fingers until mixture resembles coarse sand. Evenly sprinkle topping over mini molds. Whip Cream: In a medium bowl, beat cream, confectioners’ sugar, vanilla and salt until soft peaks form. Place into a decorative bowl and chill until ready to serve. Serve: Place the crisps and mini spoons on a decorative platter. Serve the whipped cream on the side. Garnish platter with mint. Recipe created by Parties That Cook® www.PartiesThatCook.com.